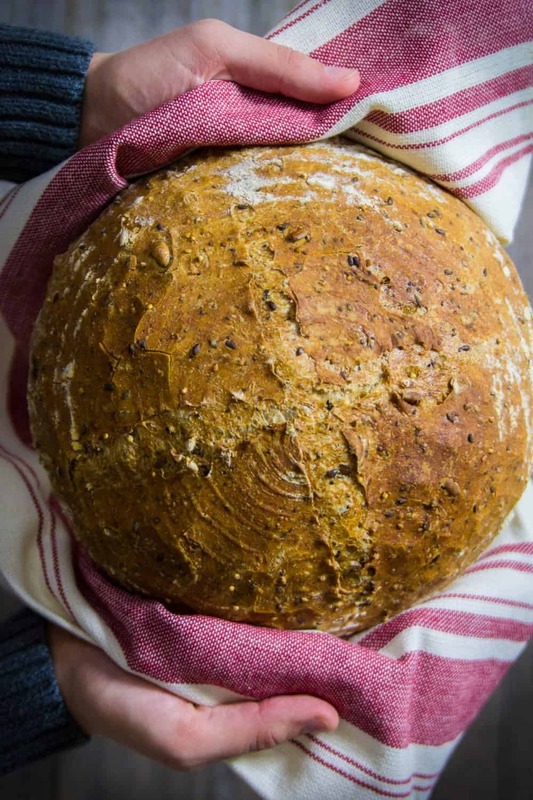 This overnight harvest bread recipe is packed with 4 different grains and 5 different seeds. The amazing crumb texture is guaranteed to please your palate! Serve this warm, with melted butter and my hearty prime rib roast for a memorable and filling dinner. This recipe was originally posted January 17, 2018, we’ve tweaked it a bit since then. This post may contain affiliate links. Read my disclosure policy here. Quite a few people find Harvest Bread or any bread making slightly intimidating. This harvest bread is really not all that complicated. The main reason people don’t dare attempt homemade bread is that it’s a lengthy process, and for a good reason. After the dough is kneaded, the long rising process is what allows a sufficient amount of carbon dioxide to make the bread light when it is baked. Therefore, this takes a little bit of time and patience. With these step by step photos, I hope bread making becomes less intimidating and more of a fun challenge. 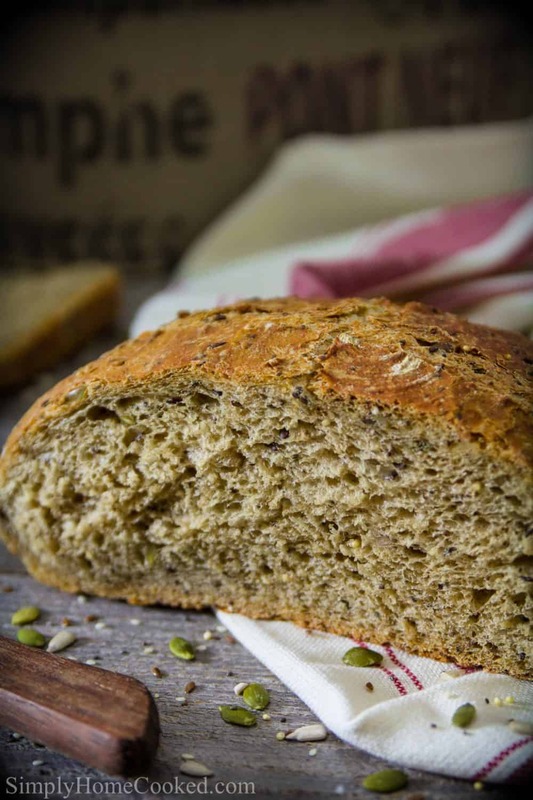 This harvest bread recipe is loaded with 4 different grains and 5 different seeds. Every bite has a perfect balance crunch and chewiness with hints of nutty flavor from the variety of seeds. When the bread is finished baking you’ll hear all those seeds crackling from the crunchy crust of the bread. Besides the wonderful crackles and pops, the aroma of freshly baked harvest bread that fills your home is something that no words can explain. This is an overview of how to make this hearty bread. Skip on down to the recipe card for the complete instructions. 1. Place the millet, flax seed, chia seeds, sunflower seeds, pumpkin seeds, and sesame seeds in a pan. Heat the seeds over medium-high heat until you can hear the seeds crackling. Make sure to mix occasionally to prevent the seeds from burning on one side. 2. Remove the seeds from the hot pan and place them into a small bowl. Pour boiling water over the seeds or just enough to cover them. Then cover with plastic wrap and let the seeds cool. 3. In a large mixing bowl, combine warm water (110 degrees Fahrenheit) with molasses. 4. Then evenly sprinkle yeast on top of the water and molasses. Wait until the yeast becomes slightly frothy. 5. Sift salt, rye flour, whole wheat flour, bread flour, and all-purpose unbleached flour into a bowl. Then stir the dry ingredients so that all the different flours are well combined. 6. Add the dry ingredients to the wet and combine it with a wooden spoon until well incorporated. 7. Place the soaked seeds into the dough. If the seeds have any extra water on top, strain before you add it to the dough. 9. Begin working the seeds into the dough with your hands. I found that stretching the dough helps incorporate the seeds best. Once you don’t see any more patches of flour, stop kneading the dough. 10. Place the dough into a large bowl (no grease necessary). Sprinkle a small amount of flour on top and cover the dough with a kitchen towel. Then let it sit at room temperature for 1 hour and 30 minutes. 11. After 1 hour and 30 minutes go by, deflate the dough and shape is back into a ball with your hands. Cover with a kitchen towel again and let is sit at room temperature overnight or 8 hours. 12. After 8 hours have passed, deflate the dough once more and reshape it into a ball and place it back into the bowl. Cover with a kitchen towel and let it sit in a warm place until it doubles in size. To speed up this step, turn your oven onto the proof cycle and place it in your oven. If you don’t have a proof setting on your oven, turn your oven on to 300 degrees Fahrenheit for 2 minutes and turn it off. This should be just enough warmth to let the dough proof. 13. Remove the proofed dough onto a floured surface and divide it into halves. 14. Shape each piece of dough into squares, then fold in each corner of the square towards the center. 15. Shape the dough into a smooth ball and place it into lightly floured 9-inch proofing baskets. Dust the dough with flour and cover with a kitchen towel. Let it proof in a warm place for 1 hour and 30 minutes or until it doubles in size. 16. Place a cast iron or Dutch oven pot (with lid) into the oven and let it heat up to 500 degrees Fahrenheit. 17. Once the oven reaches 500 degrees Fahrenheit remove the pot from the oven. Open the lid and dust the bottom of the pot with flour. Gently flip the proofed dough into the cast iron or Dutch oven pot. 18. (optional) Using a sharp blade make a few decorative slits into the top of the dough. 19. Using a spray bottle, lightly spray the bread dough with 3-4 sprays of warm water. Then place the hot lid on top and bake at 430 degrees Fahrenheit for 20 minutes. Note: Most people place an oven-safe bowl filled with water in the oven to achieve that nice bread crust; I find that lightly spraying the bread with a spray bottle filled with warm water is an easier way to achieve the same results. 20. Then remove the lid from the pot and bake for an additional 15-20 minutes at the same temperature. 21. The moment the bread is baked, CAREFULLY remove the bread with a spatula and place it onto the cooling rack. Be very cautious as the cast iron will be extremely hot. If they are unsliced, you can store the homemade bread unwrapped at room temperature. After you slice it, you’ll need to wrap the bread to prevent it from going stale. You can either wrap it tightly in plastic wrap or in closed paper bags. How long does bread keep? Homemade bread only stays good for about 2-3 days, so eat it up or share it with family. 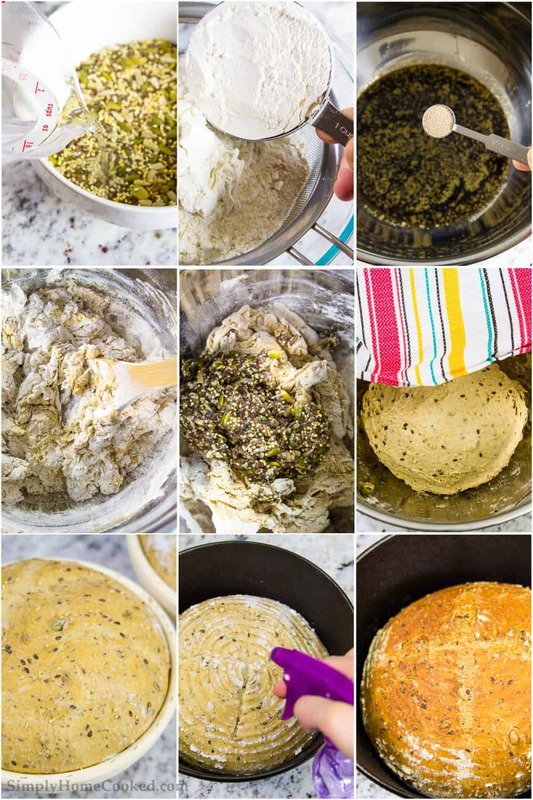 This bread recipe is loaded with 4 different grains and 5 different seeds. Every bite has a perfect balance crunch and chewiness with hints of nutty flavor from the variety of seeds. Place the millet, flax seed, chia seeds, sunflower seeds, pumpkin seeds, and sesame seeds in a pan. Heat the seeds over medium-high heat for about 3-5 minutes or until you can hear the seeds crackling. Make sure to mix occasionally to prevent the seeds from burning on one side. Remove the seeds from the hot pan and place them into a small bowl. Pour 3/4 cup boiling water over the seeds or just enough to cover them. Then cover with plastic wrap and let the seeds cool. In a large mixing bowl, combine 2 cups warm water (110 degrees Fahrenheit) with 3 tbsp molasses. Then evenly sprinkle 2 tsp yeast on top of the water and molasses. Wait until the yeast becomes slightly frothy. Sift 2 tsp salt, 1/2 cup rye flour, 1/2 whole wheat flour, 1 cup bread flour, and 3 1/2 cups all-purpose unbleached flour into a bowl. Then stir the dry ingredients so that all the different flours are well combined. Add the dry ingredients to the wet and combine it with a wooden spoon until well incorporated.
. Place the soaked seeds into the dough. If the seeds have any extra water on top, strain before you add it to the dough. Begin working the seeds into the dough with your hands. I found that stretching the dough helps incorporate the seeds best. Once you don’t see any more patches of flour, stop kneading the dough. Place the dough into a large bowl (no grease necessary). Sprinkle a small amount of flour on top and cover the dough with a kitchen towel. Then let it sit at room temperature for 1 hour and 30 minutes. (Keep between 68-70 degrees Fahrenheit). 10. After 1 hour and 30 minutes go by, deflate the dough and shape is back into a ball with your hands. Cover with a kitchen towel again and let is sit at room temperature overnight or 8 hours. 11. . After 8 hours have passed, deflate the dough once more and reshape it into a ball and place it back into the bowl. Cover with a kitchen towel and let it sit in a warm place for 2 hours or until it doubles in size. To speed up this step, turn your oven onto the proof cycle and place it in your oven. If you don’t have a proof setting on your oven, turn your oven on to 300 degrees Fahrenheit for 2 minutes and turn it off. This should be just enough warmth to let the dough proof. 12. Remove the proofed dough onto a floured surface and divide it into halves. 13. Shape each piece of dough into squares, then fold in each corner of the square towards the center. 14. Shape the dough into a smooth ball and place it into lightly floured 9-inch proofing baskets. Dust the dough with flour and cover with a kitchen towel. Let it proof in a warm place for 1 hour and 30 minutes or until it doubles in size. 15. Place a cast iron or Dutch oven pot (with lid) into the oven and let it heat up to 500 degrees Fahrenheit. 16. Once the oven reaches 500 degrees Fahrenheit remove the pot from the oven. Open the lid and dust the bottom of the pot with flour. Gently flip the proofed dough into the cast iron or Dutch oven pot. 17. (optional) Using a sharp blade make a few decorative slits into the top of the dough. 18. Using a spray bottle, lightly spray the bread dough with 3-4 sprays of warm water. Then place the hot lid on top and bake at 430 degrees Fahrenheit for 20 minutes. Note: Most people place an oven safe bowl filled with water in the oven to achieve that nice bread crust; I find that lightly spraying the bread with warm water is an easier way to achieve the same results. 19. Then remove the lid from the pot and bake for an additional 15-20 minutes at the same temperature. 20. The moment the bread is baked, CAREFULLY remove the bread with a spatula and place it onto the cooling rack. Be very cautious as the cast iron will be extremely hot.